Certain gestures and facial movements are usually good indicators of a lie in progress. If your boss averts her eyes when she tells you “what a good employee you are”, or if your spouse looks at his finger nails when telling you “how gorgeous your new dress looks”, you can be almost certain that you are being told some half-truths or mistruths. Psychologists have studied these visual indicators for as long as humans have told lies. Since dishonesty is so widespread and well-studied it comes as no surprise that there are verbal cues as well — just as telling as sweaty palms. A well-used verbal clue to insincerity, ironically, is the phrase “to be honest“. Verbal tee-ups such as this are known by behavioral scientists as qualifiers or performatives. There is a growing list. I wish I could tell you what she said next. But I wasn’t listening—my brain had stalled. I was bracing for the sentence that would follow that phrase, which experience has taught me probably wouldn’t be good. Certain phrases just seem to creep into our daily speech. We hear them a few times and suddenly we find ourselves using them. We like the way they sound, and we may find they are useful. They may make it easier to say something difficult or buy us a few extra seconds to collect our next thought. Yet for the listener, these phrases are confusing. They make it fairly impossible to understand, or even accurately hear, what the speaker is trying to say. Take this sentence: “I want to say that your new haircut looks fabulous.” In one sense, it’s true: The speaker does wish to tell you that your hair looks great. But does he or she really think it is so or just want to say it? It’s unclear. Language experts have textbook names for these phrases—”performatives,” or “qualifiers.” Essentially, taken alone, they express a simple thought, such as “I am writing to say…” At first, they seem harmless, formal, maybe even polite. But coming before another statement, they often signal that bad news, or even some dishonesty on the part of the speaker, will follow. In other words, “if you’re going to lie, it’s a good way to do it—because you’re not really lying. So it softens the blow,” Dr. Pennebaker says. Of course, it’s generally best not to lie, Dr. Pennebaker notes. But because these sayings so frequently signal untruth, they can be confusing even when used in a neutral context. No wonder they often lead to a breakdown in personal communications. Some people refer to these phrases as “tee-ups.” That is fitting. What do you do with a golf ball? You put it on a peg at the tee—tee it up—and then give it a giant wallop. Tee-ups have probably been around as long as language, experts say. They seem to be used with equal frequency by men and women, although there aren’t major studies of the issue. Their use may be increasing as a result of social media, where people use phrases such as “I am thinking that…” or “As far as I know…” both to avoid committing to a definitive position and to manage the impression they make in print. “Awareness about image management is increased any time people put things into print, such as in email or on social networks,” says Jessica Moore, department chair and assistant professor at the College of Communication at Butler University, Indianapolis. “Thus people often make caveats to their statements that function as a substitute for vocalized hedges.” And people do this hedging—whether in writing or in speech—largely unconsciously, Dr. Pennebaker says. “We are emotionally distancing ourselves from our statement, without even knowing it,” he says. So, if tee-ups are damaging our relationships, yet we often don’t even know we’re using them, what can we do? Start by trying to be more aware of what you are saying. Tee-ups should serve as yellow lights. If you are about to utter one, slow down. Proceed with caution. Think about what you are about to say. 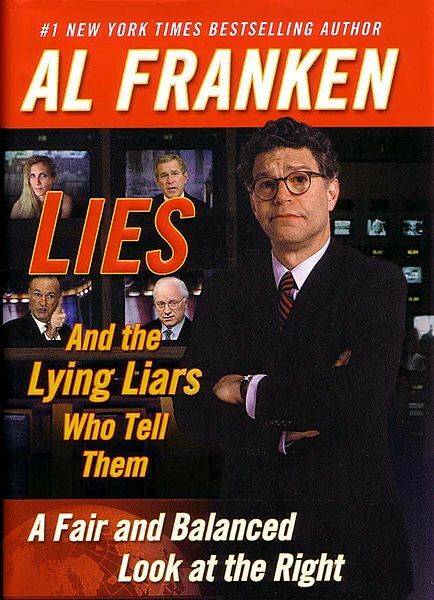 Image: Lies and the Lying Liars Who Tell Them, book cover, by Al Franken. Courtesy of Wikipedia.